When babies enter the world, they should be offered a pure and limited palette. Take it slow and gentle. Natural remedies can play a vital role in baby's care and provide gentle yet effective relief from minor ailments, even enhancing many experiences associated with the care of a new baby. In caring for baby's skin, the most natural way is usually best. Use products which are as pure and natural, baby-specific and bland as possible, particularly during the first few weeks. The more complex an ingredient list reads, the more likely it will be that baby may have an allergic reaction to one of the ingredients. Simple formulas are ideal for newborns and for anyone who has sensitive skin. Flutterbye baby products are safe, gentle and appropriate for all ages. Be assured that we use pure and natural essential oils and carrier oils, organic herbs and herbal infusions, and no synthetics, colorants, pesticides or chemical preservatives. Aromas affect the most primal part of the brain and can be associated with memories that last a lifetime. Babies and children are often cranky, have trouble settling down, and experience aches and pains, cuts and scrapes. As parents, we try to offer the best care possible, and we think aromatherapy offers just that. To introduce aromatherapy to babies, place 2 drops of essential oil (try Lavender) on a tissue and keep it nearby when you are feeding him or her. He will come to associate the aroma with love and comfort. Use this scent at night to help him sleep. When you leave the child with a sitter, the aroma will comfort and reassure him. 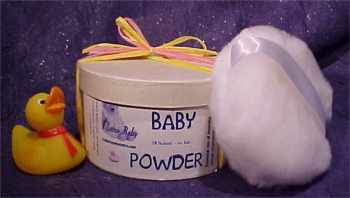 If your baby has a diaper rash, avoid using powder until it is cleared up. The starch in the powder could irritate the rash if it's a yeasty rash. If you need a powder to user during this time, let me know and I'll make you a special blend.